I ended up here on death row - the place where all the unwanted and unloved lost souls of the city go. I waited and waited for my chance, but everyone walked past me. I guess I am too happy? Too young for some or too old for others? Too small? Not pretty enough? I just don't know why nobody will love me! NOT RESERVED - WALLY WILL BE KILLED SHORTLY at San Bernardino City Animal Shelter. 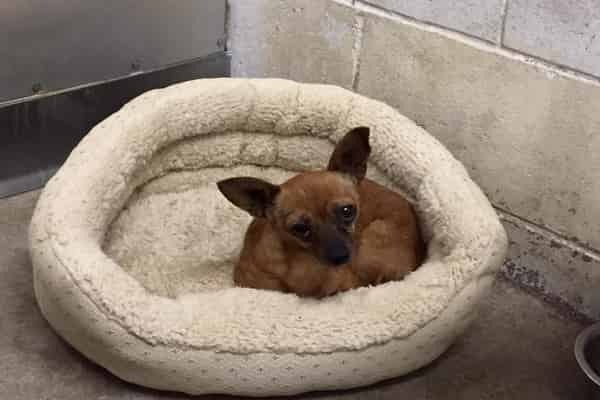 Wally was hit by car, seen by vet and back at shelter.. My name is WALLY and I am an unaltered male, tan Chihuahua - Smooth Coated. Shelter staff think I am about 3 years old. 4 Responses to "I ended up here on death row - I just don't know why nobody will love me"
Just shared this on FaceBook. Chihuahuas are perfect apartment dogs! They can be litter-box trained! Think about that benefit. And their loyalty, affection, playful nature. Please send him to Aberdeen, Ohio. I have a friend who wants him. William Ballard in Aberdeen, Ohio wants him.